Tuesday marked Bolsonaro’s first trip abroad since being elected president last autumn, with the right-wing Brazilian head of state choosing Washington as his first foreign destination. US President Donald Trump has been giggled at on social media after he gave Brazilian President Jair Bolsonaro what was claimed to be “a homemade” football jersey with the latter’s name glued to it in a do-it-yourself style during the pair’s meeting in the White House’s Oval Office. Having first exchanged compliments on Twitter, the two leaders made up their minds to seal their friendship by presenting shirts to each other. 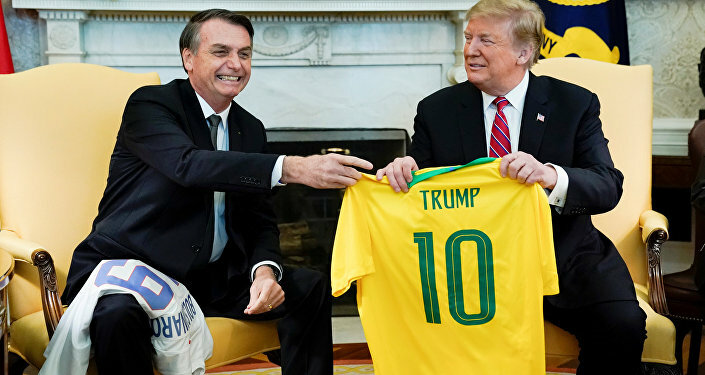 Bolsonaro took the lead and handed his gift to Trump – an iconic yellow Brazilian jersey, featuring the name “Trump” and the number “10” on it, which is the number used by the nation’s football legend Pele, as well as at some point by Ronaldinho. 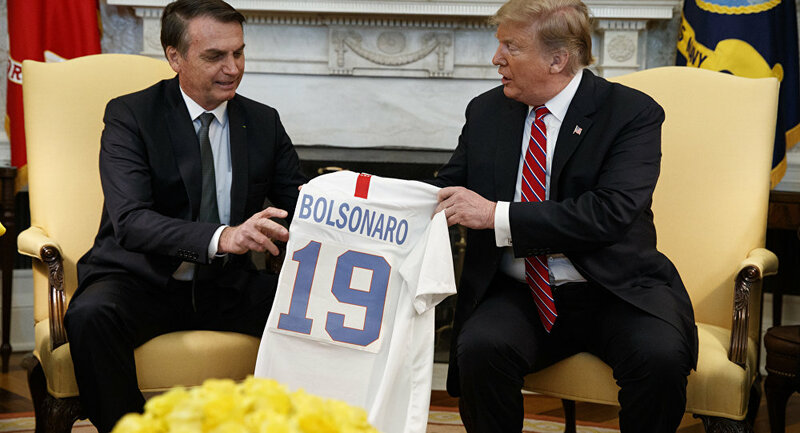 However, the gift that Trump extended to his Brazilian counterpart appeared in the eyes of some to be incredibly tacky, fixed in a slipshod manner with the word “Bolsonaro” emblazoned on what seemed to be a standard, no-name T-shirt – a fact that was instantly picked up on by attentive netizens, despite many pointing out that football is not a top popular sport in the US. Some even took note of Bolsonaro glancing several times at the newly-received shirt in puzzlement, as well as showing an apparent urge to examine it with his fingers. Social media users ridiculed Trump’s gift, calling it “a paper cut out” and suggesting the White House could have come up with a more adequate gift than a “regular jersey” with a “piece of paper slapped on it”. — Andrew C Bly (@82acb) 20 марта 2019 г. — John 🏴󠁧󠁢󠁳󠁣󠁴󠁿 🦄 (@jjrrzy) 20 марта 2019 г. — jack Lord oatkon (@Bookhimdannom1) 20 марта 2019 г. — Insta:@EuLeoFlash⚡️ (@euleoflash) 20 марта 2019 г. "Trump gets Bolsonaro in the USA"
— 🍊Sandy Vause 🍊 (@sandylovatodj) 20 марта 2019 г. — ‎ـمِليـ ـكآ (@3rror_404_) 20 марта 2019 г.
Brazil’s right-wing president and former army Captain Jair Bolsonaro visited President Trump at the White House for the first time on Tuesday. During the talks, Trump announced he would designate Brazil a major non-NATO ally, opening the door for Brazil to receive more US military aid, with the two leaders further discussing what they called the “fake news” and touched upon the Venezuelan crisis and an increase in their efforts to remove the country’s President Nicolas Maduro from office.